In the United States, 1 in 50 people over the age of 25 have some form of bipolar disorder. In fact, the United States has more cases of bipolar I and II per-capita than any other nation in the world. 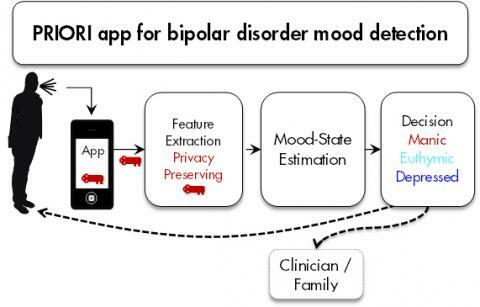 Researchers at the University of Michigan are now testing a new smartphone app for Android, code-named PRIORI, that can help detect if someone is having a bipolar episode. While the app still requires more testing before launch, a group of 60 volunteer American patients are already starting to show promising results, according to a study funded by the National Institute of Mental Health and facilitated by the Prechter Bipolar Research Fund at the University of Michigan Depression Center. PRIORI is designed to learn over time to monitor a person’s voice and detect subtle changes in mood. A change is a signal that the user might be having either a manic or depressive episode. Privacy in conversations may be of concern to patients wanting to use this app, but, according to the research team, only the patient’s side of the conversation is recorded. The app will simply alert the person’s health care team of the possible early signs of a mood swing. “These pilot study results give us preliminary proof of the concept that we can detect mood states in regular phone calls by analyzing broad features and properties of speech, without violating the privacy of those conversations,” said Zahi Karam, a member of the Michigan team, at the International Conference on Acoustics, Speech and Signal Processing in Italy. According to the team, which is led by computer scientists Karam and Emily Mower Provost, and psychiatrist Melvin McInnis, this technology could also help people with other conditions, such as schizophrenia and post-traumatic stress disorder. Seed funding for the app and research study came from the Michigan Institute for Clinical and Health Research.